The first project of the year/semester was our team banner. Making this brought us all closer and we got to know each other better. When our teachers first mentioned this project and said 'we are going to choose your groups" i got soo upset but now I know why they did that. I now know many more people because of this banner. When we first started this project our teachers told us to shout out different words that describe our team. There were different words: unique, achievers, crazy, loud, busy, funny, talkative etc. Then the teachers said our team is like a bee hive. We were in groups and in each group we all had ideas for our team name like Xolos, The Whales, los tamales and many more I can't remember but finally someone came up with The Atomic Hive. We all liked the name and each person came up with a design for our team banner. Roy and Jahzeel won and we combined there designs. After we learned how to use tools and cut our octagon's we had to paint each one of them yellow. After it all dried we transfered the design in pencil and then we painted it over with black. We put them all together. We might have struggled a little putting it together but in the end it all turned out to be one of the best and only banners in the 9th grade wing. We weren't just becoming a team or classmates but a family. It was one of the best projects this semester getting to work as a team and getting to know other people. I was really impressed of how we worked together. It was barely the second or third week of school, I knew some people from last year but not from my group. It was very awkward at first. I was surprised that people that don't know each other can come together and make such beautiful artwork. Something that I was very proud of was that everyone helped out. If someone made a mistake no one got mad they just helped fix it, and we didn't know half the people there. Something I would change would be the shape (the octagons) when we tried to put it together there were spaces that needed to be filled so we had to put other octagons on top of the banner and I really didn't like that. Many people just say I learned teamwork but I already had that this time a learned how to win and loose. When we all had to draw the design i wanted mine to win I got some votes but I lost, at first i was kind of sad but then I was just thinking they are going to be more opportunities to win. Almost everyone liked Roy's and Jahzeel's so it was pretty fair. We were all proud of how the banner turned out. After the project we didn't just stop talking to each other we started to become a team better said a family. The Snapshot Comic Strip is one of our first independent reading projects and it was a kind of a fun assignment. We had to read a book of our chose in a month. I decided to read the Hunger Games by Suzanne Collins. 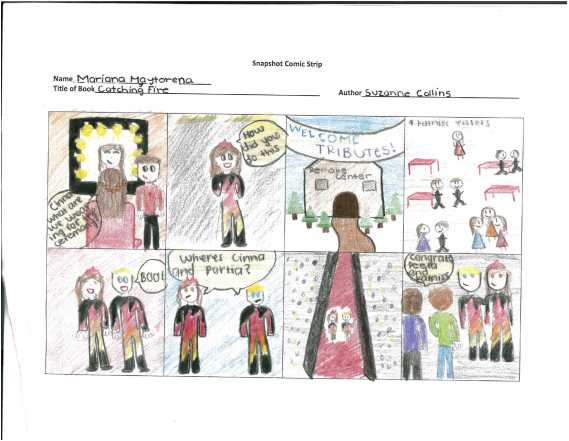 For this project we had to chose an important event and draw it out on an eight box comic strip. At first It was hard to choose one event and to write a 3 or 4 paragraphs of what we drew, and why we drew this specific drawing, but then after you thought about it you just got three events that were interesting/most important and just broke it down and got the most important one. Before we started reading Romeo and Juliet we made hats for each character. The hats had to describe their personality. Each time we read the play we had to put the hats depending on which characters appear in the scene. Each day we decided what characters people were going to be. The students that are appearing in the play have to go get the hats we made and put them on. We had 2 days to make the hat we chose to make. It was a good idea so we can bond with our classmates for 2 periods. 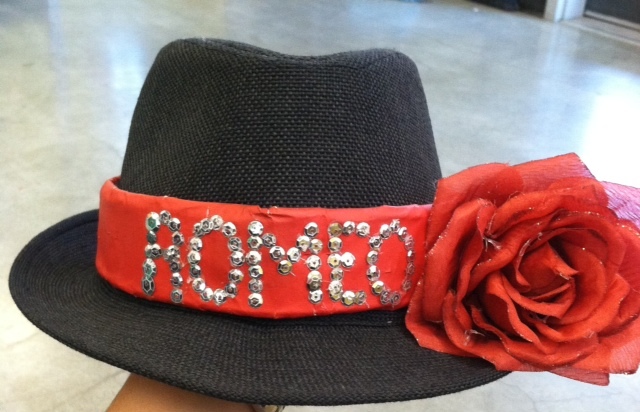 I made Romeos hat with my partner. It was really fun seeing everyones hat and getting to play the roles. Looking back on my work I want to change the design. Make it a different shape. Also make the hat not have a hat already. Make the shape and have a different rose. i feel that I just wanted to get it over with and have my partner bring a hat. This project was to have fun in making a hat and be creative. I feel that I was not creative and Was just boring. We were not going to get graded on this but I made a goal in the beginning of the year to make an effort on every project. For this project we had to choose and independent reading book. Ms. Britt recommended us to read a book that was not a movie yet. She said this because we had to make a movie poster describing an important scene in our book. We also had to make a movie proposal. 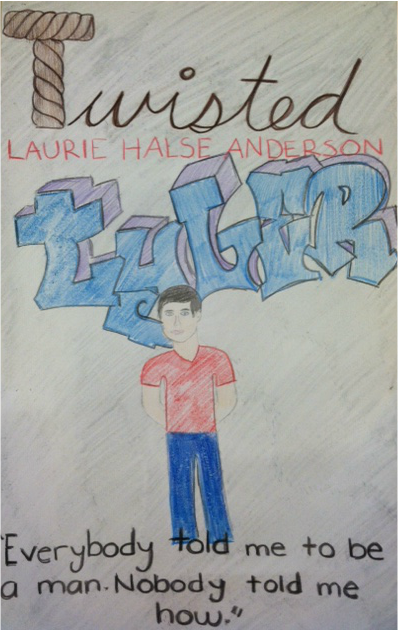 On the Movie poster we had to put the author of the book the name of the book a quote describing the book and to draw an image of an important scene or a part of the book. We had about a week to do it. We had about a month to read our independent reading book. It had to be creative and had to have color. This was our 3rd independent reading assignment. This project was stressful for me because I started reading the book the 2nd day we were assigned to read but then I stopped and did not read. The day Ms.Britt assigned us the project we had a week to turn it in. I had to start reading the book and finish it before I started the project. I started reading and it took me 6 days. The next day I had to go buy the poster and make the movie poster. It took me a long time to do it because it was due the next day. I went to sleep really late making this. I always leave homework or projects for last minute. I have to learn to do it in time and not do it the last minute. I did this sloppy but I finished it and got a good grade. This was a great experience for me and hopefully my teammates. For this Festival Del Sol project was one of my favorite and hardest project I have ever worked on. We had to make a Kinetic Sculpture with found objects. 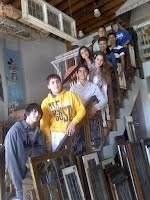 We started by going to the Architectural Salvage, where we had to get inspiration for our sculpture and have ideas of what we could usetoputon our sculpture. We gathered up all the objects which was just wood, string, and paint. It might look really easy to make but it was really hard. Making the measurements correctly putting it together, attaching the strings. That took us the whole two weeks and we had to come after school to finish. And the sculpture was not even done for festival we still had to paint it. Before we did our sculpture we had to go all around the school and find two things that represent our school, I could of been anything. We chose the bench, the bathrooms the front of the school, the flag and the grass field. We chose this because students have worked on these projects. This represents our school because we make things we have creativity and this school is a project based learning school. We dont just buy things but we make them and we put them in the bathrooms. And show how everyone gets to be a part of this school. Each students work is up somewhere around the school. We dont make projects just because teachers want to but there is always meaning behind the project. We also chose the front of the school because there is an important piece there. That has meaning and will stay there in memory of Sean. This touched my heart when I heard Sean's story. It affected me and made me have a different perspective of the artwork shown in the front of the school. Our team cared so much about this we discussed this during class and took a whole period. It was really deep and opened our minds to make meaning in our sculptures. Before that discussion we did not realize how important meaning was. Well at least I didn't. This girl made this mural as her senior project as memory for Sean. We were talking about this and I was thinking that it is important to have meaning in sculptures and that we can not just do it because it looked pretty or it was a good idea. After we all went around school to find inspiration everyone's mind change. Their point of view changed. Before we went and build our sculptures we had to make a pitch presentation of our ideas. I pitch presentation is putting our ideas and thought of what we want the project to be and getting ideas from the audience to improve on the project we want to do. We had two presentation. Which would be two different ideas. We seperated the group in half. So it was half and half. One group did one presentation and the other group did the other presentation. The first Idea was making Kind of like a fountain. The second one was making an infiniti sign with plastic tubes. These were completely different ideas than what we ended up with. because I did not like either one of them. It improved in many ways than what we had. It is more simple. Our first designs were to complicated I did not even get what we were doing and I was in the group. Everyone was getting frustrated and mad because we changed our idea so many times but we finally came up with a better idea and simpler. Our Final design had a good meaning and was in a good place that will stay there forever. Many wanted to stick with what we had first, but it's a better idea to change and not stay with the same idea, and make some modifications. 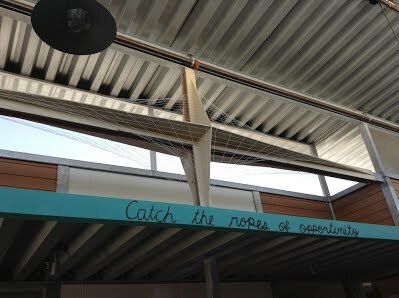 Our Narrative is "Catch the Ropes of Opportunity". We struggled so much with our Narrative. Our narrative was either too short or too long. It was never right. We came up with different ideas. We were either trying to make it longer or shorter, we never got it right. We finally were able to come up with a perfect Narrative. I believe it was one of the best. For me "Catch the ropes with opportunity" is much more than just words. This school teaches you to never give up and go for your dreams. To reach higher every time. And make goals for yourself. We wanted this to represent our choices. Even though there's good and bad choices in life.